Dec. 31, 2018 (AltAfrica)-People around the world are set to ring in the New Year, and Europe and Africa are now gearing up to welcome 2019. 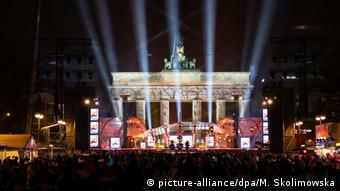 DW is keeping track of all the New Year’s celebrations across the globe. NEW YEAR’S EVE 2019: CELEBRATIONS AROUND THE WORLDNew year for New ZealandThe Pacific nation Samoa was the first full country to greet 2019, with New Zealand following not too long after. Above, fireworks explode from the Sky Tower in Auckland. Fiji and Tuvalu also said goodbye to 2018 at the same time. As per tradition, Russian state television broadcasts 12 chimes of the Kremlin clock as Moscow welcomes in the New Year. This is traditionally followed by the national anthem. 20:00 The United Arab Emirates are entering 2019: Residents and visitors in Dubai have seen a laser, lights, and fireworks spectacle launched from the world’s tallest skyscraper, Burj Khalifa. Officials have said some two million people were expected to descend on the city center for the show, according to the local daily The National. 18:30 The New Year has now arrived in India. Although Hindu worshipers have their own calendar, where the year begins on a different date every year, the arrival of 1 January is also a major event. Indians usually sing, dance and attend parties for the New Year celebration, similar to the people in other parts of the globe. 17:47 Paris is gearing up for the gigantic New Year’s Party at Champs-Elysees where hundreds of thousands of people are expected to appear. 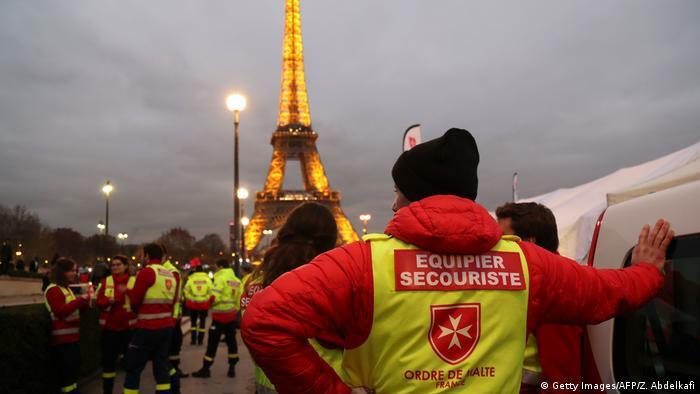 The celebration will be guarded by 12,000 police officers, who will be searching bags and confiscating alcohol before allowing revelers into the main party area. The anti-government “yellow vest” movement has called for “non-violent and festive” protests on the New Year’s Eve. 17:00 Thailand is now celebrating the arrival of 2019. In the Buddhist-majority country, many locals travel to the Takien Temple outside Bangkok to mark the New Year with a symbolic resurrection ritual. Worshippers climb inside coffins while monks cover them with pink sheets and perform funeral rites. The symbolic rising from the dead is meant to get rid of bad luck and give the visitors a fresh start in 2019. 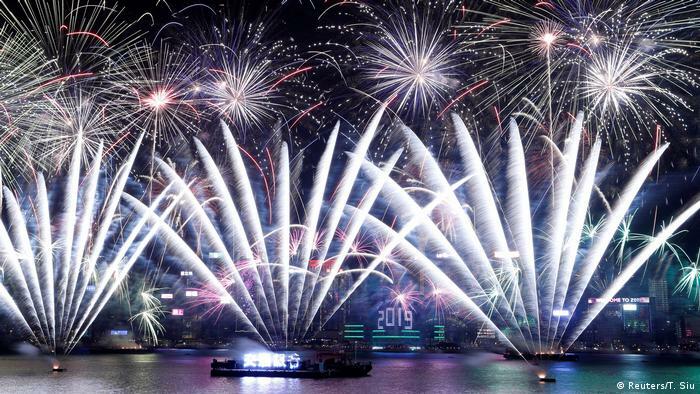 16:00 Although the Lunar New Year is still king in China, revelers gathered in Hong Kong for a massive fireworks display marking the arrival of 2019. In Beijing, celebrities attended a VIP gala dedicated to the 2022 Winter Games. President Xi Jingping addressed the nation before the evening news, saying that his government “sent out China’s voice” into the world. The celebrations in China came an hour after Japan welcomed the 2019 with a bout between American boxer Floyd Mayweather and Japanese kickboxer Tenshin Nasukawa. The 41-year-old American defeated the local champion in less than three minutes. 15:47 Berlin opened its party mile which starts at the city’s iconic Brandenburg Gate and stretches some two kilometers (1.24 miles) west to the Victory Column. The party is set to start in a few short hours, with city officials promising “live bands, DJs and a spectacular fireworks display at midnight.” British pop singer Bonnie Tyler is also set to perform. 14:00 Brisbane celebrated New Year’s an hour later than Sydney — even though Brisbane is located 2 degrees longitude east of Sydney. 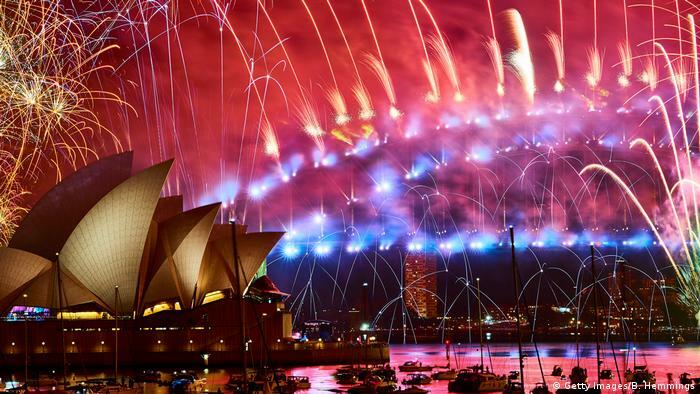 13:00 Tens of thousands have gathered in Sydney despite stormy conditions to witness the city’s spectacular fireworks show for New Year’s. Organizers say it will be the most expensive celebration ever at 6 million Australian dollars ($4.2 million, €3.7 million). The 12-minute show was to feature 100,000 pyrotechnics and culminate at midnight with “(You Make Me Feel Like) A Natural Woman,” a song made famous by the recently deceased Aretha Franklin. 12:00 Most of the remaining island Oceanic nations have now bid farewell to 2018. 11:00 Fiji, Tuvalu, and New Zealand have now joined in on the festivities. Fireworks were shot from the top of the Sky tower in downtown Auckland, New Zealand to ring in the new year. Anadyr, the easternmost town in Russia, has also entered 2019. 10:00 Samoa has become the first full country to enter the new year. Fireworks exploded over the Samoan capital of Apia for locals and tourists who timed their visit to enter 2019 before anyone else. The Pacific nation shifted to the zone west of the international date line eight years ago, jumping forward 24 hours and wiping out December 30, 2011. The island of Kiritimati, part of the group of islands that makes up Kiribati, and Tokelau, an island territory belonging to New Zealand, were also among the first islands to enter the new year. The expression could come from the Yiddish word “rosch.” Rosh Hashanah, the name of the Jewish New Year, is, however, set in the fall on a different date every year. Other linguists relate the expression to the archaic German meaning of “Rutsch” – a journey.